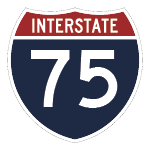 Interstate 75 southbound between state Route 613 and the Wood County line will be restricted to two lanes through the work zone for guardrail repair. Work is being performed by the ODOT roadway services department. State Route 15 eastbound between township Road 196 and state Route 330, just west of Vanlue, will be restricted to one lane through the work zone for guardrail repair. Work is being performed by the ODOT roadway services department.